I need to (re)add themes to the game. I used to have a “theme” concept, but it quickly turned into just “level definition”. The problem was that I was trying to customize too much, expecting to tweak everything, rather than separating only the data I actually tweak. In practice, I don’t have time nor inclination to do so. Most of my assets now seem to follow “good enough” mentality. 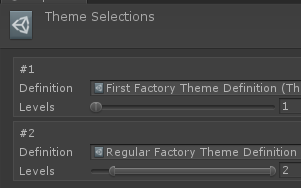 Anyway, I need to restore theme concept so that I can have variation in the levels. I can’t currently swap the levels around because I have a fixed progression, so to speak. I expect there to be multiple layouts and multiple themes and I already have multiple definitions. Then on to my favourite part: creating more assets! Of course, all of this was much messier than I documented. There’s a lot of wires running all through the code connecting it all. Thankfully, my architecture and dungeon generation are (I think) well-designed, and it took me hours instead of day to change. Now, there is an important gameplay consideration here. Themes should not be random — they are too big of a decision to be completely random. The player will notice if the same theme repeats or very different themes follow each other or variety is low or some such. I might go the route of pre-determined levels, but I don’t like this. I think the first level will always be a (variation of) starting/spawn area that fits the story. And then the levels become fairly random from there. The question is how I decide on this. First and last selections have no choice but to be the corresponding first/last themes. Now, I have 3 regular themes for levels 2-9 and 3 will get chosen. Then they get padded to be 2 of each to proportionally fill the group. And finally random ones get chosen to pad the remaining “slots”. Good enough. I can always adjust depending on how much art I have and what sort of styling I am going for. I will probably have later levels have themes only seen in later levels, and same for earlier levels. 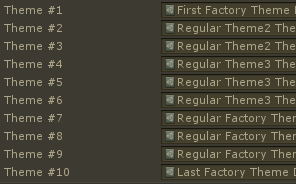 That way, over time, the player associates certain themes with certain progression. There are things I want to add to theming. Like certain props only spawning in certain themes (e.g. high-tech – blue batteries; maintenance – toxic battels, etc.). But I really need to hold off feature-creeping this. If I get art assets for this, I might consider things like these. For now, I still have a thousand things to fix and implement. Copyright © 2019 Rudy's Blog. Powered by WordPress. Theme: Spacious by ThemeGrill.